In collaboration with the Producing Artistic Director, Robin manages office functions, including bookkeeping, registration, and communications. Robin has worked in arts and nonprofit management for over ten years. She served on the board of the Herndon Foundation for the Cultural Arts from 2005-2015 and managed ArtSpace Herndon on a volunteer basis from the center’s launch in 2008 through 2012. There she directed day-to-day implementation of the artistic vision, coordinated visual arts exhibits, supervised volunteers and staff, and was responsible for budgeting, strategic planning, and grant writing. With a BA in Public Policy and Political Science from Duke University and an MBA from the University of North Carolina at Chapel Hill, Robin’s professional experience is in banking, marketing, strategic planning, and finance. In addition to her responsibilities at Traveling Players, Robin works part-time for the Arts Council of Fairfax County. 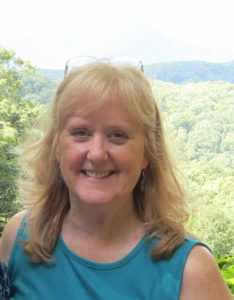 A Herndon resident for over 20 years, Robin has volunteered in the schools, with Boy and Girl Scouts, Herndon Homes Tour, and Udvar-Hazy Center of the National Air and Space Museum. In 2013, Robin was honored as one of three Women in the Arts by the Council for the Arts of Herndon and was recognized by the Town of Herndon with a Distinguished Service Award. She completed Leadership Fairfax’s Lifetime Leadership Program in 2015.